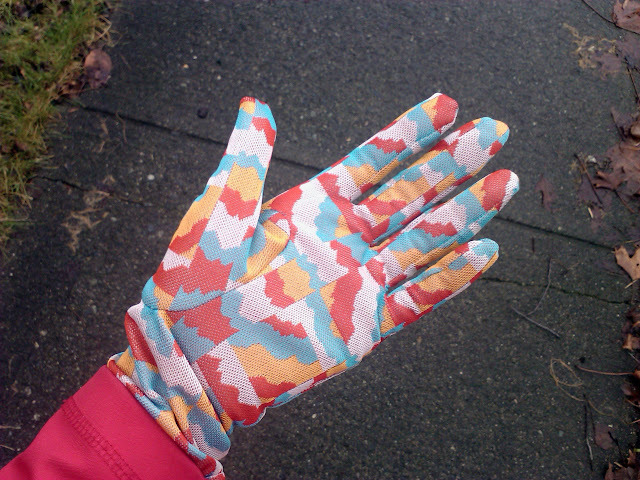 It's difficult to find gloves I like in my size (my nickname was 'Meathooks' in high school, to give you an idea why) so I thought I'd try making some. I picked up Vogue pattern #7949 at a Fabricland Boxing Day sale & made my first pair quite quickly during a couple of afternoon naps this past week. It doesn't take long but it's really fiddly. There are five pieces per glove, 1/8" seam allowances & lots of very awkward seams in between the fingers. I used some old vintage fabric I have had lying around for ages, but I think this might have made the project more difficult--it wasn't that easy to work with. I'm fairly happy with the result, though there are a few mistakes. The loud print kind of camoflages the puckers here & there. I see this pair as practise. Next pair will be out of a thin polar fleece, I think. I also plan to make gloves for more of my costumes. I saw those gloves today - had I known that you sewed them, I would absolutely have asked to see them. They were lovely in person. I'm truly impressed. I love to sew as well, but I've never tried anything quite that fiddly.